Our Unmanaged switches help to make setting up local networks easier, allowing you to connect multiple devices together without needing to go through a complex configuration process. The terms “Gigabit” and “Fast Ethernet” both refer to the maximum link speed that a given switch can support. TRENDnet’s 8-Port Gigabit PoE+ Switch, model TPE-TG44g, reduces equipment and installation costs by delivering data and power over existing Ethernet cables. 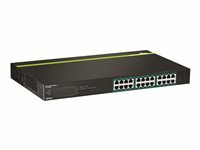 This unmanaged switch offers four Gigabit PoE+ and four Gigabit non-PoE ports. The PoE+ standard supplies up to 30W of power per port for devices such as high power wireless access points, PTZ (Pan Tilt Zoom) Internet cameras, and VoIP telephony systems. Auto sensing technology delivers 30W to 802.3at PoE+ devices, 15.4W to 802.3af PoE devices, and only data to non-PoE devices. GREENnet technology reduces energy consumption when the switch is not in use.Boost office efficiency and reduce network congestion with a total switching capacity of 16Gbps. LED indicators display device status for efficient troubleshooting. This switch comes in a sturdy metal case and quickly adds PoE+, PoE, and non-PoE devices to your network. Eight gigabit ports provides a 16Gbps switching capacity to support edge network installations. A 61.6W PoE power budget supports up to four Power over Ethernet devices. 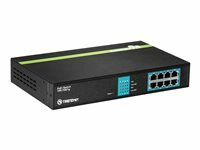 TRENDnet’s 8-Port Gigabit GREENnet PoE+ Switch, model TPE-TG81g, reduces equipment and installation costs by delivering data and power over existing Ethernet cables. 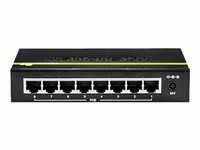 This unmanaged switch offers eight Gigabit PoE+ ports which supply up to 30W of power per port for devices such as high power wireless access points, IP Cameras, and VoIP telephony systems. It supports both PoE (802.3af) and PoE+ (802.3at) devices with a 110W PoE budget. This rack mountable switch features a fanless design that eliminates operating noise and lowers energy consumption. A 110W PoE power budget supplies up to eight Power over Ethernet devices. Fanless design lowers energy consumption and eliminates operating noise. The 8-Port Gigabit PoE+ Switch, model TPE-TG82g, delivers data and power over existing Ethernet cables to Power over Ethernet (PoE) devices such as Access Points and IP Cameras. It supports both PoE and PoE+ devices with a 61W PoE budget. Plug and Play this sturdy metal switch for reliable high-speed PoE networking. A 61W PoE power budget supports up to eight Power over Ethernet devices. With a compact and lightweight housing design, this switch is well-suited for desktop installations. Its fanless design is ideal for quiet environments that require silent operation. TRENDnet’s 16-Port Gigabit PoE+ Switch, model TPE-TG160g, offers 16 x Gigabit PoE+ ports, a 32 Gbps switching capacity, and a PoE power budget of 246 Watts. This rugged metal switch comes with a rack mount kit. The large 246 Watt PoE power budget supplies full PoE power to every port, thereby maximizing the number of allowable connected PoE devices. TRENDnet’s 24-Port Gigabit PoE+ Switch, model TPE-TG240g, offers 24 x Gigabit PoE+ ports, a 48 Gbps switching capacity, and a PoE power budget of 370 Watts. This rugged metal switch comes with a rack mount kit. The large 370 Watt PoE power budget supplies full PoE power to every port, thereby maximizing the number of allowable connected PoE devices. 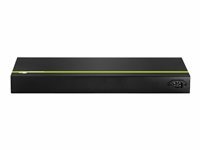 All Gigabit ports produce a 48 Gbps switching capacity and support Jumbo Frames up to 10 KB. 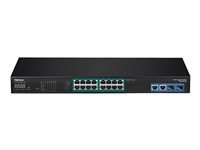 TRENDnet’s 26 Port Gigabit 400 Watt AV PoE+ Switch, model TPE-3026L, offers 24 x Gigabit PoE+ ports and 2 x SFP slots, with a total Power budget of 400 Watts. View total power, available power, and power-per-port with a convenient front-panel 4-digit seven-segment LED display. Ports conveniently located in the back for improved cable management. A 220 Watt PoE power budget supplies up to sixteen Power over Ethernet devices with PoE power. In most business environment’s, TRENDnet’s AV switches will serve a dual purpose. The switches allow business owners to simultaneously manage AV equipment, IP surveillance cameras, and wireless access points. 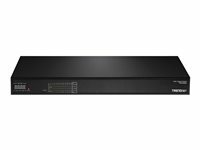 TRENDnet AV Series Switches easily expands a home’s existing wired network for high bandwidth devices, especially those devices dedicated to multimedia sharing and home surveillance. 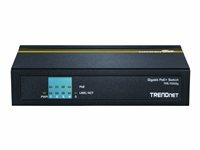 With both sets of ports on the back, TRENDnet AV Series Switches are ideal for use with TRENDnet NVRs. The AV switches are equipped to provide all the power needed to run several TRENDnet surveillance cameras simultaneously. TRENDnet's 12-Port NVR PoE+ Switch, model TPE-3012L, is designed for use with an 8-channel NVR surveillance system. 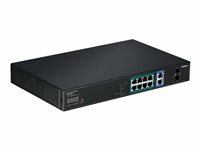 In addition to the eight Gigabit PoE+ ports, this NVR switch features four uplink ports for dedicated connections to your network, NVR, and / or NAS devices. With a 120 watt total power budget, the TPE-3012L provides you with enough power for even the most demanding surveillance applications. Use the convenient front-panel LED display to view total power, available power, and power-per-port. Rack mountable hardware design and front-panel LEDs easily integrate into your existing NVR and IP surveillance solutions. Eight gigabit PoE+ ports allow users to connect eight IP cameras while still providing four gigabit uplink ports for dedicated connections to your network, NVR and / or NAS devices. A 120 watt PoE+ power budget supplies up to eight Power over Ethernet devices with PoE power. Gigabit ports produce a 24 Gbps switching capacity and support Jumbo Frames up to 10 KB. TRENDnet's 18-Port NVR PoE+ Switch, model TPE-3018L, is designed for use with a 16-channel NVR surveillance system. Users are able to connect all 16 IP cameras to the switch, while still providing 2 shared uplink ports for dedicated connections to your network, NVR, and / or NAS devices. This switch features a 220 watts total power budget, providing you with enough power for even the most demanding surveillance applications. Use the convenient front-panel LED display to view total power, available power, and power-per-port. Rack mountable hardware design and front-panel LEDs easily integrate into your existing NVR and IP surveillance solutions. A 220 watt PoE+ power budget supplies up to 16 Power over Ethernet devices with PoE power. Gigabit ports produce a 36 Gbps switching capacity and support Jumbo Frames up to 10 KB.